This product is available in Amazon.in, Flipkart, Tatacliq, Ebay. At amazon.in you can purchase SAMSUNG Gear S3 Frontier Smartwatch (Stainless Steel) for only Rs. 19,719, which is 24% less than the cost in Ebay (Rs. 25,999). 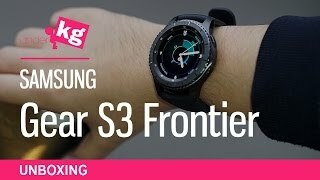 The lowest price of New Imported Samsung Gear S3 frontier smart watch Space Grey was obtained on April 23, 2019 8:39 pm. I’ve had my GS3 Frontier watch for 6 days, so I am ready to update some of my initial observations. These were the positives that I found:1) Just as with the Gear S2, setup was a breeze. The Samsung Gear app in my Galaxy Note 5 picked up the S3 immediately and went through setting it up effortlessly. It was nice to see that I can toggle between my S2 and S3 settings by simply selecting the watch model from the dropdown in the top left corner of the app.2) Even though the watch is fairly big at 46mm — larger than my 42mm Movado Series 800 — it didn’t look large on my wrist. Maybe I was just prepared for the size, but the features on the watch like the rotating bezel, buttons, and screen are well balanced. Maybe the dark color helps but it didn’t look or feel big on my slender wrist. By the way, that rotating bezel is awesome. I bet Apple wishes they had thought different!3) The watch faces that came with it were pretty nice compared to the funky ones that the S2 had. I felt less of a compulsion to buy replacement ones, although if you pay a few bucks, there are a few good ones out there that are more functional than the stock watch faces.4) The speaker on the watch rocks! I left it at the default loudness setting of 4 and I can hear calls perfectly. The maximum call volume is 6. I had my lady call me from the phone. She is very soft-spoken and I could hear her perfectly. You don’t need to bring the watch close to your mouth to be heard clearly. For all other sounds, which are Ringtone, Media, Notifications and System, I left them set to 7. Maximum volume for those is 15. Again, the speaker is pretty loud for such a small device.5) Answering or rejecting calls using voice works very well. I travel often to California, where stricter cell phone laws go into effect in January 2017. I’ll be glad to have this baby on my wrist so that I can avoid tickets with my Inspector Gadget gear!6) I haven’t had a chance to test the altimeter, but the speedometer and GPS work very well. I tested them with the free Speedometer app and the speed matched that on my car dashboard. I love hiking, so it’ll be interesting to see how well the technology works and whether an app ecosystem can grow out of those features.7) The screen looks really clear and bright. I have brightness set to 6 and the screen is perfectly readable indoors and in direct sunlight.8) I also tried the Sleep As Android app to test the S3’s biometric sensors. Except for a short period when my phone couldn’t get data, the app was able to collect sleep-related data the whole night. I don’t think that I will track my sleep with the watch every night because of its size, although I bought a replacement strap for it that is very supple and sleeping with it wasn’t too uncomfortable.9) The S3 can let you control your favorite music app on your phone (music is routed through your phone speakers) or you can listen to tracks that are on the watch itself (music is routed through the watch speakers or through attached bluetooth headphones). Check out Spotify. The S3 now has a native Spotify app that frees you from having to interact with your phone. If you setup WiFi access and log into Spotify Premium from your watch, you can stream music directly to it without having your phone with you or powered on. This feature shows how the S3 is increasingly becoming a dependable device in its own right.Now onto the reasons why I gave it 4 stars:a) Maybe it’s the size of the rotating bezel in this larger watch face, but it feels loose. There is a slight wobble on the S2, but if you tap the rotating bezel on the S3, you can actually hear it sound as if it is loose. Maybe they can make it a bit tighter in the next model.b) The S Voice assistant is very rudimentary. In the age of Siri, Alexa and even Cortana, Samsung needs to catch up quickly with integrating AI into such an otherwise feature-packed watch! What’s the point of cramming in so much processing power if one is left with only a glorified phone dialer? 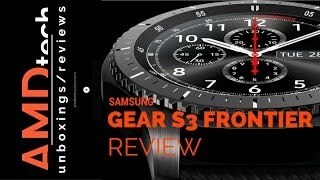 SVoice needs to get smart.A few things that improved my experience with the S3:- I got a comfortable watch strap that is perforated for breathability. The watch is pretty large, so I tried to make wearing it as comfortable as possible. A comfortable strap made from stretchy material also helps the watch hug your wrist if you are sleeping with it without being uncomfortable. Biometric sensors on the watch work best if they are closest to your skin.- Speaking of biometrics, give the Sleep As Android app a try if you are concerned about the quality of sleep. It collects a fair amount of data, but to me the most important one was the “deep sleep” periods.- Spotify for S3 frees you up from using your phone, but you do have to log onto an available WiFi and also have the Spotify Premium to make your S3 fully independent.Notice that I didn’t complain about the absence of good apps. That’s because a great app marketplace doesn’t happen overnight. Apple has dominated that space, but the Samsung Gear S3 has plenty of features that can be used creatively. Spotify is an example of native apps that can become big hits. I have even heard that the video chip on it can drive a 720p display! Imagine being able to screencast pictures or even video from a watch some day!! (The S3, by the way, only allows you to synchronize pictures and songs at this time; not video. )If I find more cool things to do with it, I will come back and provide an update. I hope you found this information useful. Classic looks better than frontier. If you are not going for lte than classic is better option. Great features, great battery life but only for big sized wrists! Its been 2 months i purchased this watch and its simply awesome till date. You wont regret getting one!! I’ve had my GS3 Frontier watch for 3 days, so I am ready to update some of my initial observations. Unlike a review that I read recently, I wasn’t expecting the unboxing to be an experience unto itself; needless to say, the Frontier isn’t a Rolex. These were the positives that I found:1) Just as with the Gear S2, setup was a breeze. The Samsung Gear app in my Galaxy Note 5 picked up the S3 immediately and went through setting it up effortlessly. It was nice to see that I can toggle between my S2 and S3 settings by simply selecting the watch model from the dropdown in the top left corner of the app.2) Even though the watch is fairly big at 46mm — larger than my 42mm Movado Series 800 — it didn’t look large on my wrist. Maybe I was just prepared for the size, but the features on the watch like the rotating bezel, buttons, and screen are well balanced. Maybe the dark color helps but it didn’t look or feel big on my slender wrist. By the way, that rotating bezel is awesome. I bet Apple wishes they had thought different!3) The watch faces that came with it were pretty nice compared to the funky ones that the S2 had. I felt less of a compulsion to buy replacement ones, although if you pay a few bucks, there are a few good ones out there that are more functional than the stock watch faces.4) The speaker on the watch rocks! I left it at the default loudness setting of 4 and I can hear calls perfectly. The maximum call volume is 6. I had my lady call me from the phone. She is very soft-spoken and I could hear her perfectly. You don’t need to bring the watch close to your mouth to be heard clearly. For all other sounds, which are Ringtone, Media, Notifications and System, I left them set to 7. Maximum volume for those is 15. Again, the speaker is pretty loud for such a small device.5) Answering or rejecting calls using voice works very well. I travel often to California, where stricter cell phone laws go into effect in January 2017. I’ll be glad to have this baby on my wrist so that I can avoid tickets with my Inspector Gadget gear!6) I haven’t had a chance to test the altimeter, but the speedometer and GPS work very well. I tested them with the free Speedometer app and the speed matched that on my car dashboard. I love hiking, so it’ll be interesting to see how well the technology works and whether an app ecosystem can grow out of those features.7) The screen looks really clear and bright. I have brightness set to 6 and the screen is perfectly readable indoors and in direct sunlight.8) I also tried the Sleep As Android app to test the S3’s biometric sensors. Except for a short period when my phone couldn’t get data, the app was able to collect sleep-related data the whole night. I don’t think that I will track my sleep with the watch every night because of its size, although I bought a replacement strap for it that is very supple and sleeping with it wasn’t too uncomfortable.9) The S3 can let you control your favorite music app on your phone (music is routed through your phone speakers) or you can listen to tracks that are on the watch itself (music is routed through the watch speakers or through attached bluetooth headphones). Check out Spotify. The S3 now has a native Spotify app that frees you from having to interact with your phone. If you setup WiFi access and log into Spotify Premium from your watch, you can stream music directly to it without having your phone with you or powered on. This feature shows how the S3 is increasingly becoming a dependable device in its own right.Now onto the reasons why I gave it 4 stars:a) Maybe it’s the size of the rotating bezel in this larger watch face, but it feels loose. There is a slight wobble on the S2, but if you tap the rotating bezel on the S3, you can actually hear it sound as if it is loose. Maybe they can make it a bit tighter in the next model.b) The S Voice assistant is very rudimentary. In the age of Siri, Alexa and even Cortana, Samsung needs to catch up quickly with integrating AI into such an otherwise feature-packed watch! What’s the point of cramming in so much processing power if one is left with only a glorified phone dialer? 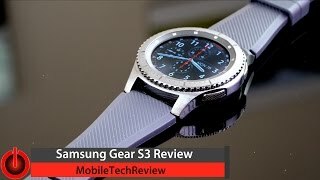 SVoice needs to get smart.A few things that improved my experience with the S3:- I got a comfortable watch strap that is perforated for breathability. The watch is pretty large, so I tried to make wearing it as comfortable as possible. A comfortable strap made from stretchy material also helps the watch hug your wrist if you are sleeping with it without being uncomfortable. Biometric sensors on the watch work best if they are closest to your skin.- Speaking of biometrics, give the Sleep As Android app a try if you are concerned about the quality of sleep. It collects a fair amount of data, but to me the most important one was the “deep sleep” periods.- Spotify for S3 frees you up from using your phone, but you do have to log onto an available WiFi and also have the Spotify Premium to make your S3 fully independent.Notice that I didn’t complain about the absence of good apps. That’s because a great app marketplace doesn’t happen overnight. Apple has dominated that space, but the Samsung Gear S3 has plenty of features that can be used creatively. Spotify is an example of native apps that can become big hits. I have even heard that the video chip on it can drive a 720p display! Imagine being able to screencast pictures or even video from a watch some day!! (The S3, by the way, only allows you to synchronize pictures and songs at this time; not video. )If I find more cool things to do with it, I will come back and provide an update. I hope you found this information useful. Received the watch in two working days.Pros: Great battery life, 3 days as promisedButtons and bezel operates like a breeze. Cons:Biggest draw back “NO SAMSUNG PAY”Wrote to customer support got a prompt reply saying, samsung pay is only available in gear S3 sold in the United States of America :(:( This is the excerpt from the return mail :”Thank you for contacting Samsung Technical Support.I understand that Gear S3 is not launching Samsung Pay when pressed back button for few seconds. I see that you are referring to non US model Gear watch. Launching Samsung Pay with back button is limited to US model phones. For further assistance, please contact Indian support by accessing the web link below.Thank you for your understanding”.Since my phone Galaxy S8 supports this and I am actively using it through my phone, this a very big disappointment.This should be highlighted by the dealer/Samsung while putting advertisement on webpages.